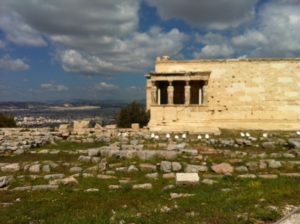 Today we went to the acropolis, which is the rocky outcrop upon which the Athenians built their most important temples. 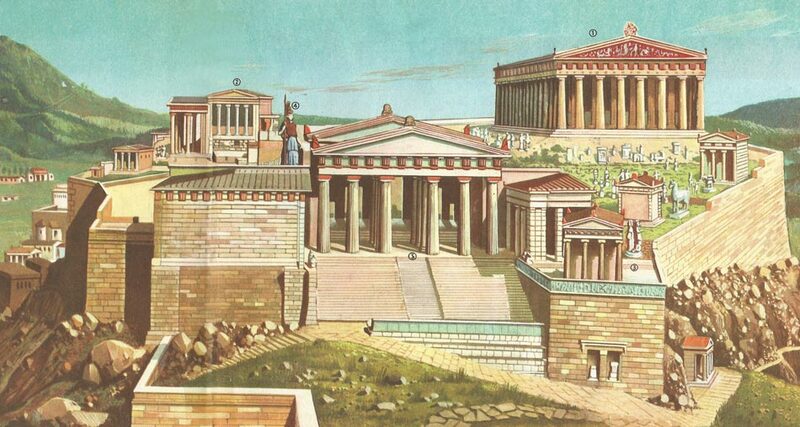 The structure in the center of this great old postcard is the entryway to the sanctuary and is called the Propylaea. It has always been the only way to get into the sanctuary, so everyone in history who has visited the Parthenon has walked through this monumental gateway. The walkway is marble and has been polished by thousands of years of foot traffic. 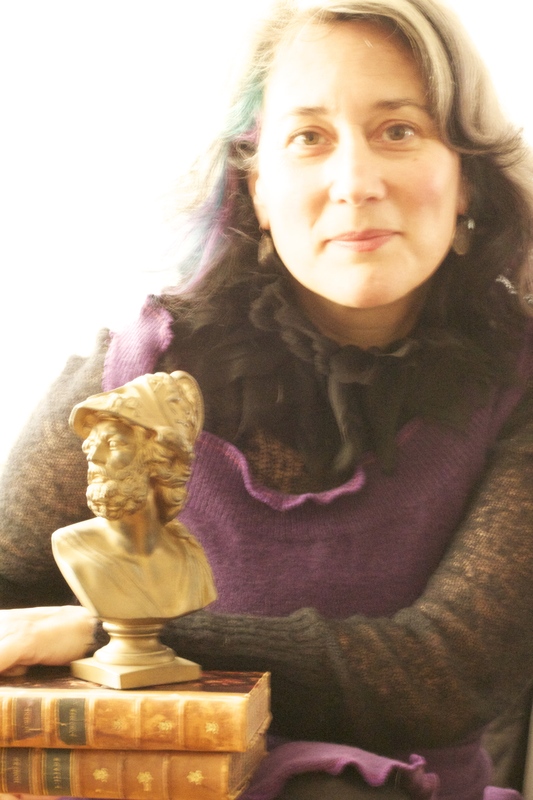 How humbled it makes you to walk in the footsteps of the great philosophers, writers, orators, and statesmen! This is truly sacred ground. The photos show the Erechtheion with the famous Caryatid porch. You can see the same building on the postcard at the elbow of the giant statue of Athena. This building is the site of the mythical contest between Athena and Poseidon. The two gods were charged with giving a valuable gift to the city in return for the devotion of the people. Poseidon struck his trident in the ground and caused a salt-water spring to appear, while Athena struck the ground with her sword and sprouted an olive tree. Athena won the contest because the olive tree is valuable in so many ways. It is said that there has always been an olive tree on the very spot, and as you can see in the photo, an olive tree graces the edge of the porch. There were originally six Caryatids on the “maiden porch,” but one of them was removed by Lord Elgin and is in the British Museum. It is said that the maidens cry out at night at the loss of their sister, and tears streak their faces in the rain. The maidens in the photo to the right are copies. 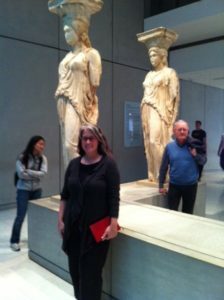 I am standing with the real Caryatids in the photo below, which was taken this afternoon at the new Acropolis Museum. 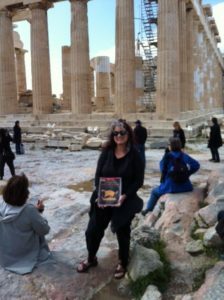 Finally, I had a photo taken in front of the Parthenon holding my book, which has been such a central part of my life and continues to direct me in new ways. Trip Notes: Today we visited the big buildings in the picture. Do you recognize the maiden columns called the Caryatids? Food I Ate Today: A special Greek confection made with sesame seeds and “mastic,” which is a type of pistachio tree. It grows around the Mediterranean and was mentioned in the Bible. Mastic has been used as a chewing gum for several thousand years. On the island of Chios, the Greeks make cuts into the bark of the tree and cause it to “weep” a sticky resin, which they harden and make into yummy treats. I Wonder: I wonder what chewing gum is made from today. Lesson and Activity: To help find our way around the world, we use lines of longitude and latitude. You can imagine the lines like a net thrown over the globe. Half the lines run up, or north to south, and we call them longitude—and half the lines run around, or east to west, and we call them latitude. If you know the latitude and longitude of any location, you can pinpoint it exactly on a map. The coordinates for Redwood City are: latitude 37 degrees North, and longitude 122 degrees West. If you have a globe or atlas at your house, find the lines of latitude and longitude. You can also look at our globe in the classroom.